The Church of the Annunciation has a long history. In the middle of the 4th century, a shrine with altar was built in the cave in which Mary had lived. Emperor Constantine commissioned a larger structure when his mother, Helena, visited the Holy Land to discover the locations of and commemorate important events in Jesus’ life. The Church of the Annunciation was founded around the same time as the Church of the Nativity in Bethlehem and the Church of the Holy Sepulcher in Jerusalem [interesting that Barluzzi worked on all three of these important churches]. It was known to still exist around 570 CE, but was destroyed in the 7th century after the Muslim conquest. The second church was built over the ruins of the Byzantine era church during the Crusades, after the conquest of Nazareth by Tancred in 1102 but was never completed. Saladin’s victory over the Crusaders at the Battle of Hittin in 1187 ended construction of the church. Five Crusader Romanesque capitals carved by stonemasons from northern France were discovered during excavations along with artifacts from the Middle Bronze Age, Israelite period, Herodian-Roman and Byzantine periods are in the small museum in the Franciscan convent. 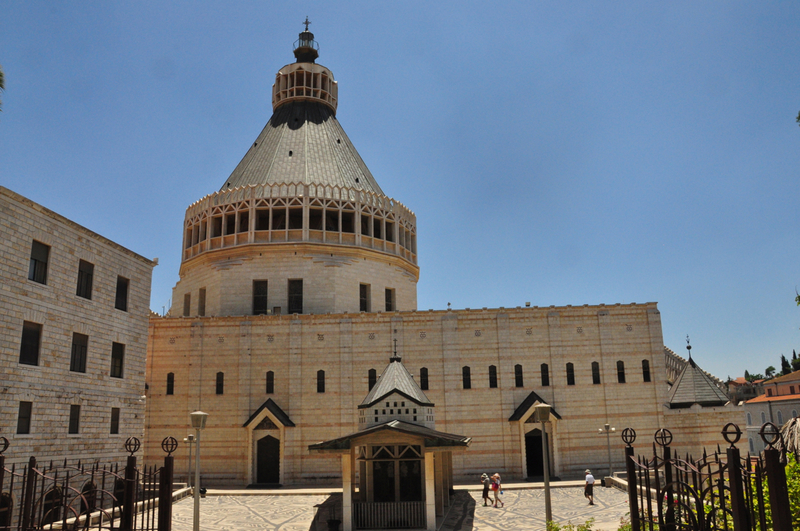 In 1260, Baybars and his Mamluk army destroyed the church during their attack on Nazareth. The Franciscans received permission to return to Nazareth in 1620 and constructed a small structure to enclose the holy grotto that is venerated as the house of Mary. In 1730, they received permission to construct a new church, which was enlarged in 1877. This church stood until 1954 when it was demolished to enable the construction of a new basilica. 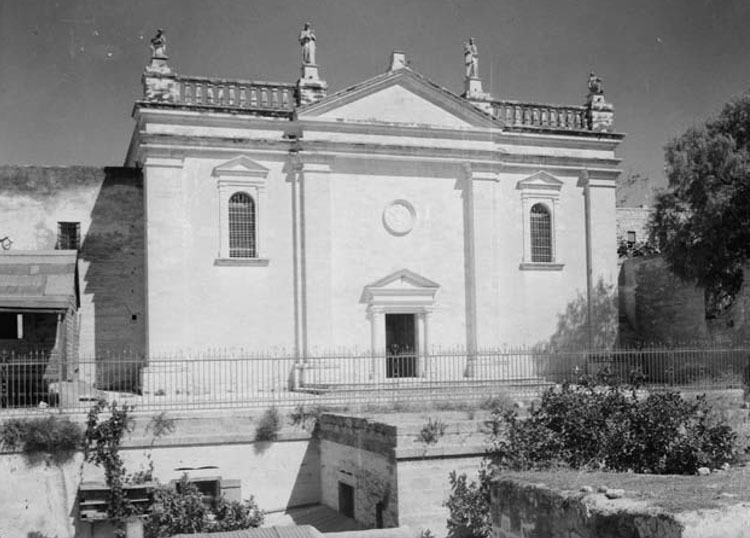 In 1924 Ferdinando Diotallevi, the custos, or head of the Franciscan Custody, with the approval of Pope Pius XI began to plan a new basilica to commemorate the Annunciation in Nazareth. Diotallevi intended to entrust the building of the church to Antonio Barluzzi, a young architect who had already proved his abilities and qualifications by building the Church of the Agony (Gethsemane, 1922-24) in Jerusalem and the Church of the Transfiguration on top of Mount Tabor (1919–24) for the Franciscan Custody. 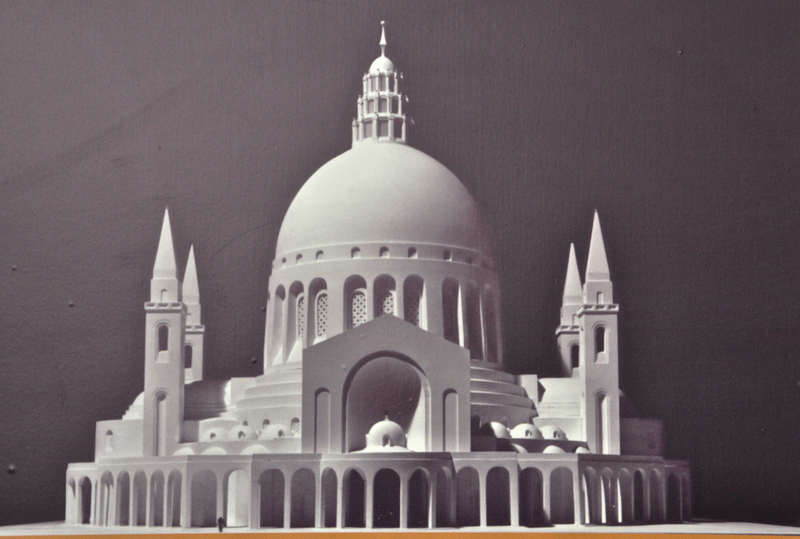 Barluzzi was asked to submit his plans for the Church of the Annunciation, but the project was aborted, due to political tensions inside and outside the Custody. The idea of rebuilding the church emerged again fifteen years later in 1939 when the new custos, Alberto Gori, reappointed Barluzzi to the project. During World War II Barluzzi resided in Italy returning to the Holy Land in 1947. During that time he designed two churches. 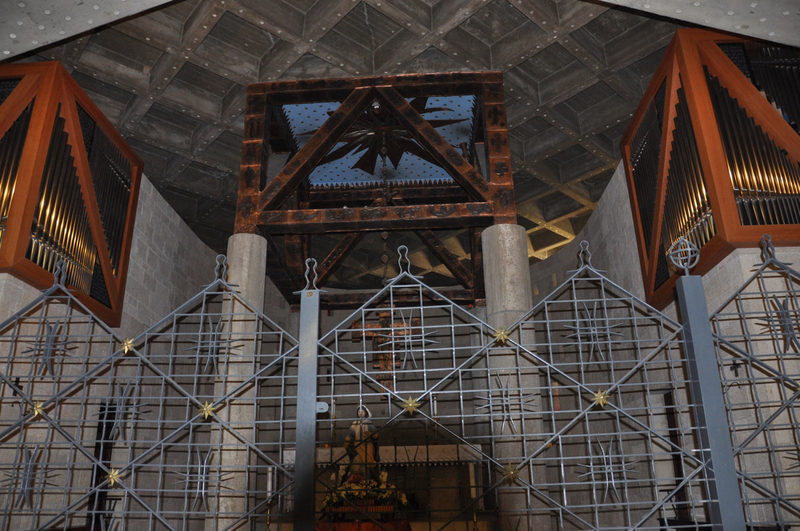 The first was the incredibly ambitious project of rebuilding the Church of the Holy Sepulcher. 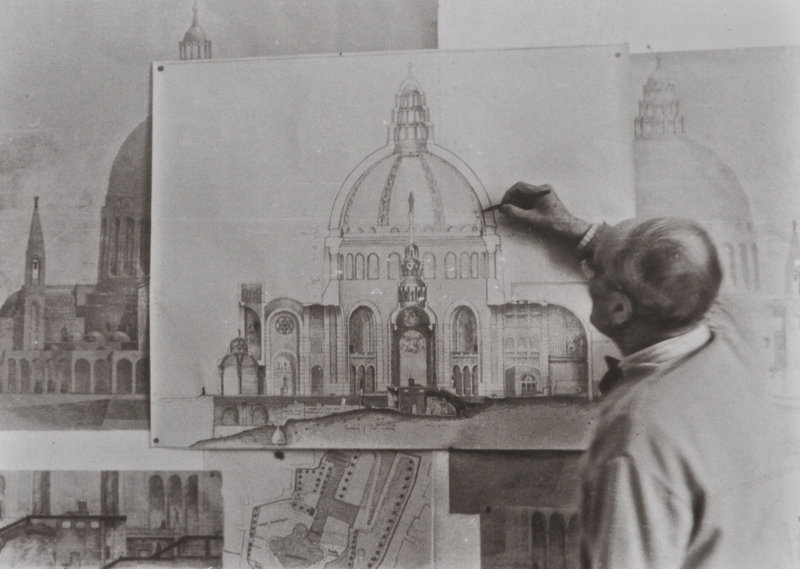 The new plan was prepared by Barluzzi and Luigi Marangoni but was never built [sometimes an architect’s best plans are never actualized, check out Louis Kahn and the Hurva synagogue]. The second was the design for the Church of the Annunciation in Nazareth which Barluzzi thought would be his final work in the Holy Land. Barluzzi designed a church in eclectic style, using contemporary construction technique, reinforced concrete covered mostly by local limestone. The church was a concentric building dominated by a large dome reminiscent of St. Peters in Rome and surrounded by four towers dedicated to the four evangelists. The towers symbolized the voices announcing to the four corners of the world the event of the Incarnation – critics said the building looked too much like a mosque. In the plan, the length of the church was 90 meters, and the height from the ground to the cross on top of the dome was 72 meters, a very large building. Inside, Barluzzi designed a rotunda over the holy grotto and four wings for the requirements of the liturgy. Like his other projects Barluzzi was involved in the smallest details of the inner decoration far beyond the usual level of architectural planning. For each statue he designated a location, character, symbolic meaning, and connection to the main theme of the church. 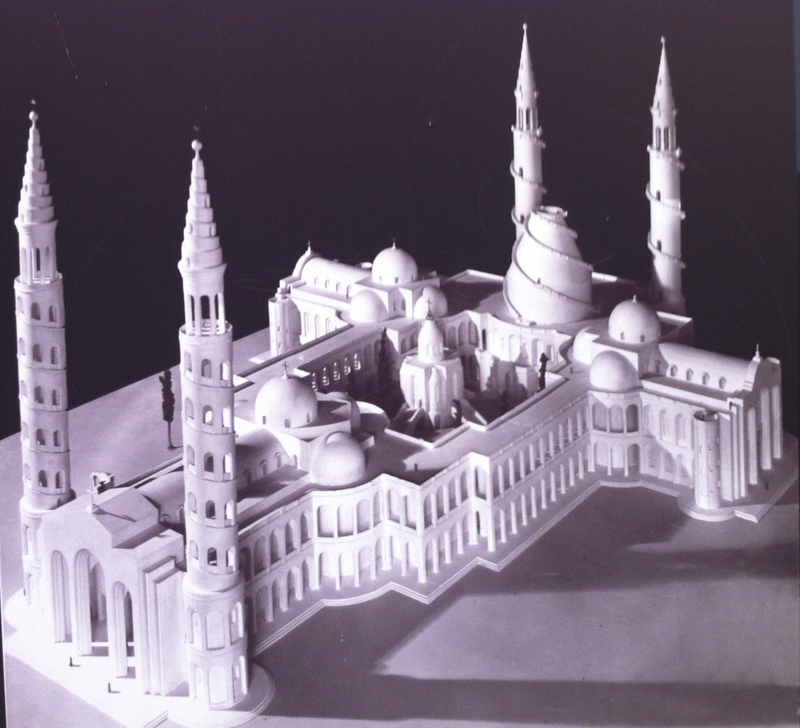 By 1941, Barluzzi had prepared many sketches of the church and a model on scale of 1:100, and his plans were approved by Father Leonardo Bello, the minister general of the Franciscan order. All the necessary permits were obtained from the State of Israel, and in December 1954, the year designated by the Vatican as the Year of Mary, the cornerstone of the church that corresponded to Barluzzi’s plan was laid in a well-attended ceremony. However, four years later, in 1958, the new Franciscan custos, Alfredo Polidori took the project from Barluzzi. Barluzzi died on December 14, 1960 in a small room at the Delegation of the Holy Land. 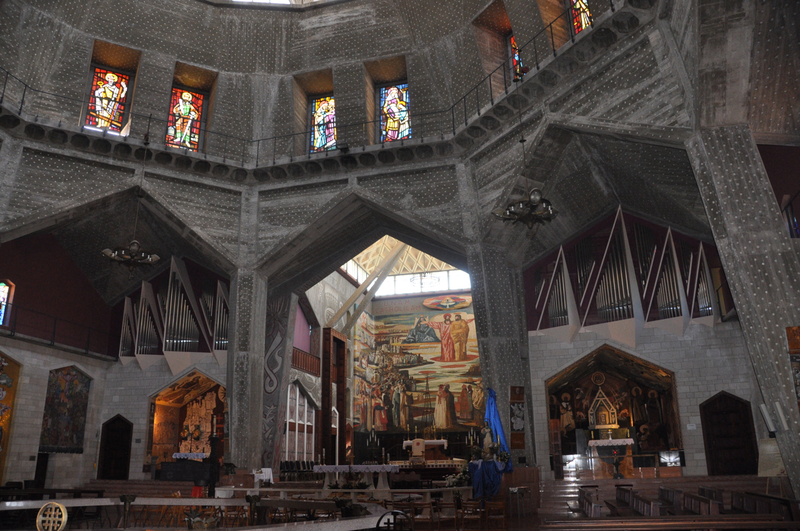 The new basilica was designed by the Italian architect Giovanni Muzio of Milan, one of the leading architects of the Novecento style who came to Israel for the first time in 1958. Muzio planned the church as a fortress, to contrast the new church with the remains of the earlier churches – he meant to convey that its fate, unlike that of its predecessors, would be different. The fortified nature of the church is evident in its size and strength, its seclusion from the urban surroundings, and the details of the building, like narrow windows, almost slits. The church dimensions are 44.6 meters long and 27 meters wide, and the dome height is 55 meters, still a large church. The outer walls are covered in light-colored combinations of local stone with modern reliefs and engravings that decorate the southern and western façades. It seems that the church was based on an earlier St. Antonio church that was built by Muzio in Varese, Italy. Muzio actually erected two churches, one on top of the other. The lower church protects the valuable archaeological remains of the Byzantine-era church which are displayed next to the holy grotto, the perimeter of the modern church follows the outer limits of the walls of the Crusader-era church. The upper church is designated for the celebration of the liturgy. 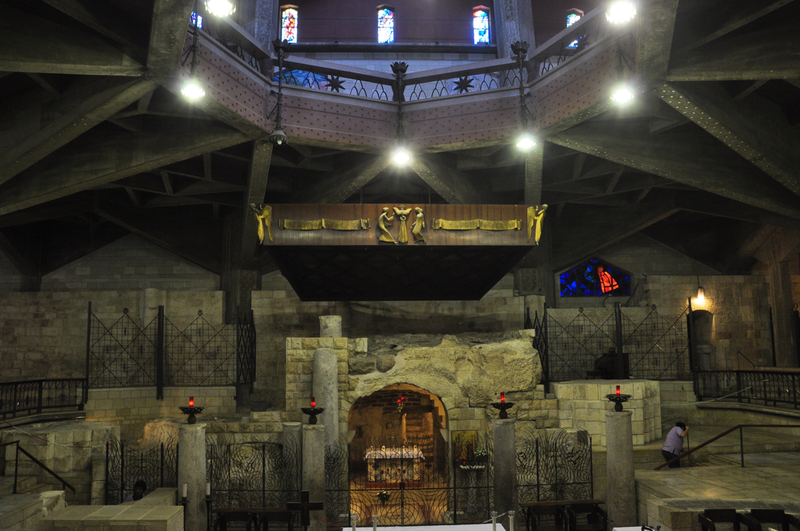 The upper church is connected to the monastery by a suspended courtyard that protects the underlying remains of the ancient village of Nazareth from the time of Jesus that was discovered during excavation work in 1955. Inside, the modern style of Muzio’s work manifests itself in the extensive use of exposed reinforced concrete and sharp angles. The stained glass windows are striking. The church is decorated by works of art dedicated to Mary and to the Annunciation that were donated by every nation of the Catholic world. Muzio was not involved in choosing the art. 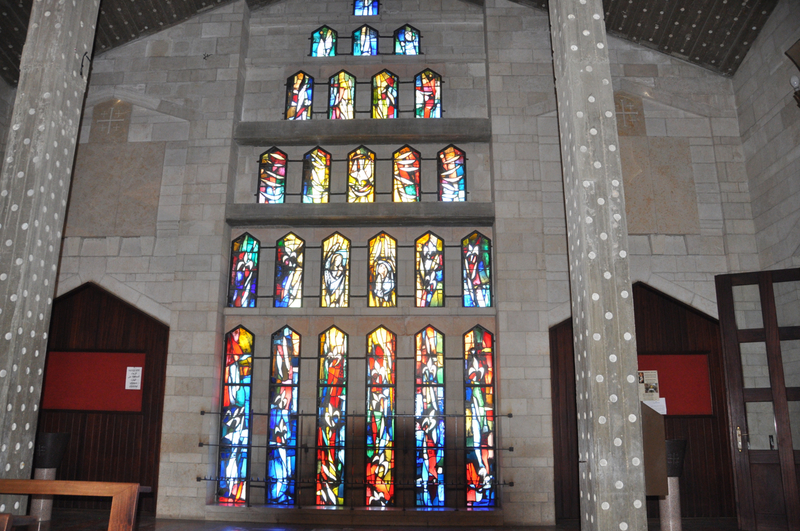 The church was built by the Israeli building firm Solel Boneh during the years 1960-69 and cost 2 million dollars. 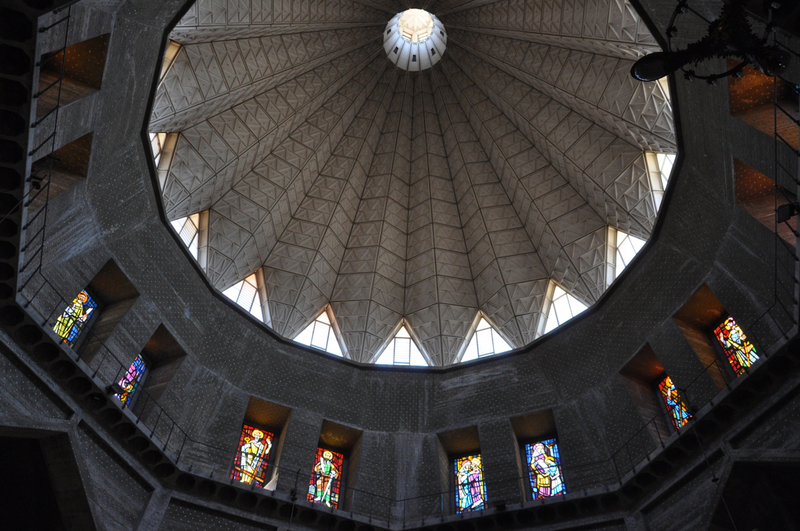 This entry was posted in Architecture, Art, Church, Pilgrimage and tagged Antonio Barluzzi, architects, Barluzzi, Basilica of the Annunciation, Franciscan, Louis Kahn, Nazareth on June 12, 2013 by Shmuel Browns. Shmuel, great post! The Matson photo of the 18th-20th century church, which I had run into before, is the only one I have ever seen. Also, I see you found some work by Ms. Halevy who has researched Barluzzi quite extensively — Good hunting on both!